This weekend I watched The Pursuit of Happyness, a movie based on the real-life rags to riches story of Chris Gardner and his son Christopher. The movie stars Will Smith in the role of Chris, and Will Smith's own son, Jaden, in the role of Chris Gardner's son. Jaden is the most adorable thing on the face of this earth by the way, and he really does steal the show. And it's good to see Will Smith in something other than his usual blockbuster action flicks. He had made a promise to himself that he would always take care of his son, after his biological father disappeared and after a childhood of abuse by his stepfather. And so, when Chris Gardner's wife left him at a point of his life when any other normal human being would seriously consider abandoning a child (or maybe even contemplate suicide), Chris Gardner kept his promise and was there every day to pick up his son from nursery. He was interning at a brokerage firm, getting no pay whatsoever, trying to find shelter and food for his son every night, sleeping in subway station bathrooms, and yet he never gave up. All the while, he was studying hard so he could get a paid job at the company he was interning at. Chris Gardner is inspirational because he never gave up. And he never lost hope. Watch the movie...you'll feel happy, sad, motivated, good, lucky and of course, inspired. Samuraisam already posted this on the UAE community website, but I thought I'd post this here again, for my (few) friends who read my blog (and for whoever has not seen the UAE community website). 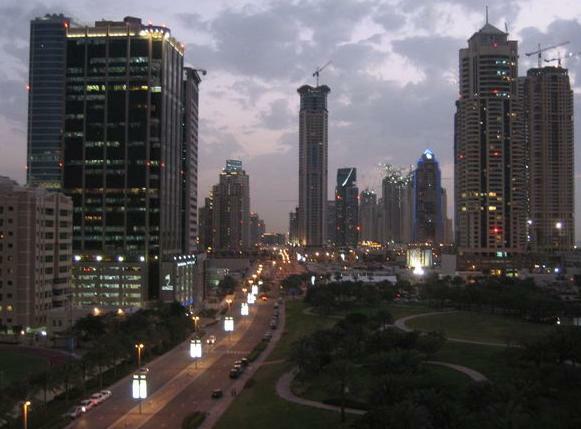 Dubai's dirty little secret is a 20/20 investigative report which aired on ABC in the US. It's an interesting and fairly balanced report on Dubai, showing both it's glittery, luxurious facade, and its dark, hidden (or not so hidden for those of us who live here, but it's still shocking to see) exploitation secrets. The report generated a heated debate with some friends today, with some arguing that the workers still choose to come here, despite the harsh living conditions, and that many of the workers state that their current conditions are still better that their living conditions back home. Another argument was that the workers come here for 5-6 years, save up some money, and go back home to live a very comfortable life which allows them to send their kids to school and provide them with a better life. There's a price to pay, but ultimately it pays off. I still think it's slavery. Even worse than slavery...I mean, 600 dhs a months is just mind-boggling. So mind-bloggling, as a matter of fact, that I can't even begin to image how someone can live on so little. And the fact that the workers can't do anything about it and have no rights is simply ridiculous! And I also think that embassies here are not being proactive at all about the situation. Heck, they're not even being reactive! It's really sad. And what's even more sad is that every day, we live in our own little bubble, sheltered from reality, and that it takes a report by 20/20 on ABC in the US to open our eyes to the things going on in our own backyard. I do hope this report will have some positive repercussions for the workers, and that the government will actually do something to improve their living conditions...or maybe that's just wishful thinking on my part. I was chatting with a friend a couple of days ago, and the conversation inevitably turned into a discussion about Dubai and how quickly it's grown and how busy it's become. He came up with an interesting analogy for Dubai. He said "Dubai is like a Sim City game,. They see that there's too much traffic in a certain area, and "pouf! ", just like magic, a new flyover comes up. Another day it's: oh, there's an empty plot of land right there, and again, just like magic, a new tower comes up". It's so true! It really is like a Sim City game! Driving on the Abu Dhabi-Dubai highway, at 160 km an hour, with your emergency lights on! Helloooo! A bit dangerous don't you think? I mean, how on earth am I supposed to know when you're changing lanes when I can't see a signal that tells me where you're going? So stupid...and so dangerous...Where are the cops? According to this 7Days article, Westerners are better tippers that Arabs. It doesn't seem like it's based on any factual or statistical evidence, but one thing I agree with is that no rules are set in the UAE about tipping, and this can lead to some confusion. In general, I prefer to tip rather than not tip. And while the below is just an idea of what I feel are right amounts to tip, I may be wrong, so feel free to give your own assessment about tipping. 1) Taxi drivers: I tend to round up the fare, or give an extra 5 dhs (in Dubai). In Abu Dhabi, I round up the fare or give an extra dirham or two. Except if the driver is rude, like the one time the driver screamed at me for getting slightly lost. Then I don't tip at all! 2) Waiters/waitresses: If there's a 15% service charge included on the bill, then I usually don't tip. If there isn't, I give a 15% tip. 3) Food delivery people: depending on the size of the order, anywhere between 5 and 10 dirhams. 4) Hairdresser: I tip the hairdresser (anywhere between 10 to 30 dirhams, depending on whether it's just a blow-dry, a cut, or highlights) and the person who washed my hair (5 dirhams). 5) Nail technician/masseuse: 10 dirhams each. 6) Car cleaning/car drying men at the carwash: 10 to 20 dirhams, depending on how many there are. 8) Person carrying your groceries to the car: 3 to 5 dirhams, depending on the amount of change I have. 9) Cleaning lady: 10 Dirhams for 2 hours of work. 10) Bartender: I usually don't tip....which is weird because in Canada I'd always leave a dollar per drink. Should I be tipping the bartender? I can't think of anyone else that I usually tip...I must have forgotten someone. Any thoughts? A man exposed himself to an eight-year-old girl by accident when his trousers fell down, he claims. The 36-year-old Indian man was cleaning in a building in the Refa area when he allegedly exposed himself to the girl, who was also Indian. He asked her to touch him, but she refused, the Dubai Court of First Instance heard. The man denied the charges yesterday, telling the court: “I was wearing old pants and the belt was also weak - it came off while I was working and my pants just fell down.” The trial was adjourned until next month so the accused can be given a lawyer. His trousers fell down? All by themselves? And did his lips move by themselves as well when he asked her to touch him? What a friggin idiot! I hope they throw him in jail and let him rot there. I can't even begin to imagine how traumatising the experience must have been for the little girl. Speaking of which, here's what happened to me a couple of months ago: as I was walking out of work with a colleague, I saw what I thought was a guy standing on the sidewalk, touching himself. I told my colleague but by the time she turned to look at him, he had stopped doing whatever he was doing. The very next day, that same colleague was leaving work, and called me to tell me she thought she saw the same guy touching himself again. She asked me to check if he was still there when I left work, but he wasn't. If I ever see him again, I'm calling the cops on him! I recently watched Paris, je t'aime, a wonderful movie that will get you laughing, crying, happy, sad, pensive, and wanting more. What's interesting about this is movie is its format: it's comprised of 18 5-minute segments, each telling a different story, each directed by a different director, each using a different cast, each representing one of Paris' arrondissements. Initially, there were supposed to be 20 segments (because there are 20 arrondissements), but apparently 2 of the segments did not make it into the movie because they could not be integrated with the rest of the story. The movie boasts an international cast, including Juliette Binoche, Steve Buscemi, Gerard Depardieu, Natalie Portman, Gena Rowlands, Elijah Wood and Nick Nolte, among others. Some segments are more interesting than others, some touched me more than others, but this is still an excellent movie that I highly recommend you watch. It was showing here during the International film festival a couple of months ago, and I'm sure it'll be out again sometime soon (it's set to open in the US in early 2007). Sometime in the last few days (or weeks), I hit the 30,000 hit mark on my blog. I had been waiting for that to happen for some time now, and when it did, I didn't even notice! I hit the 20,000 mark back in September, and the 10,000 mark back in May....I see a pattern here, 10,000 hits every 4 months! Thanks again to those of you who drop by once in a while, and to my faithful commenters. Keep coming back! I promise I'll try to be more diligent with updating my blog. We finally watched Cirque du Soleil's Quidam yesterday. Overall, the show was good. The music was great, the acts were impressive, and the art direction and costumes were stunning. But this was not the best Cirque show I have seen. I have had the chance to see 2 other live Cirque shows (Varekai and Dralion), and Dralion was by far a better show. But still, I am glad I got to see this one. The Dhs 400 ticket price for decent seats is a bit steep (something like Dhs 250 would have been more reasonable), and just like when Moryarti went to the Cirque, we were surrounded by crying, screaming children (and infants! Why would someone bring an infant to the Cirque du Soleil, I just don't understand! ), and people walking in and out. I guess we should have chosen an 8 o'clock show rather than the 4 o'clock one, but the 4 o'clock show had better seats. The show is still around for a couple of weeks, so if you get the chance to go see it, I highly recommend you do so. 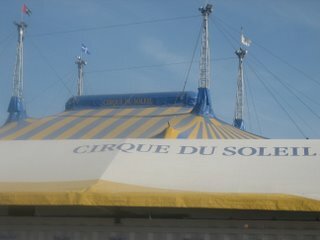 The show is a must-see, if only for its uniqueness when it comes to circuses. I found out last week that my rent can't go up this year. Here I was wondering how I could possibly afford another 15% increase, when Sheikh Mo decided that for those who had their rents increased last year, there would be no increase this year. So I won't have to leave my apartment hopefully (unless the landlord decides to kick me out because a "relative" wants to move in....). Double woohoo! In other news, my cousin (a regular reader of this blog) is visiting from out of town, and although he knows Abu Dhabi really well, Dubai is still foreign to him. So here's a question for you all: if you had some visitors from out of town, and you only had time to take them to one place in Dubai, what would that place be? Anyway, back to New Year's eve....this year, we decided we were sick and tired of spending new year's surrounded by sand (either in the desert, or camping on an island somewhere), and that we wanted to get dolled up for a change. And given the lack of interesting venues in Abu Dhabi, we decided to organize a house party at M & S's place. We had four days to prepare...and there was LOTS to prepare! It makes your realise how time-consuming and tedious it is to organize any sort of function...so, RESPECT to all you function-organizing people out there! The party was a success, all our fears of no one showing up were gone when more than 30 people came...we stayed up late, drank, ate, danced, and had a blast. After that, it was back at work...waaaay too soon if you ask me...But no worries, I have another vacation to look forward to, very soon....no travelling....just getting rid of all those 2006 vacation leftover days...YAY! Too tired to post anything else...I am functioning on 4 hours of really bad sleep, but I will divulge celebration details later. I can't believe I am back at work tomorrow...ugh....This vacation has passed waaaay too quickly!